This competition is organised by the Municipal Authority, hereafter referred to as "the Organiser", assisted for the purposes of coordination, supervision and technical and artistic advice by a distinct party referred to as "Coordinator". Postponement:Displays may not be postponed for any reason. In the event that a display firing is cancelled, the conditions stated in Article 15 will apply. Display times:Displays are scheduled to be fired at 22:00 on 20 July and 27 July, and at 21:30 on 3 August and 10 August. Firing order:The order to commence display firing will be given by walkie-talkie, by the Manager of the Espace Léo Ferré or his representative, in liaison with the Coordinator. Return a copy of these competition rules, accompanied by Ministerial Decree n° 96-137 of 11 April 1996 on the classification, marking, distribution and use of fireworks, appended hereto, or any regulatory text replacing it, duly initialled and signed. Return the completed registration form. Supply an extract from the Companies Register confirming that the entrant has a business address in the country of origin and a genuine, recognised business activity in the pyrotechnical display industry in that country. Supply a certificate from an insurance company, and provide a written undertaking to contract additional insurance cover as necessary, it being stipulated that personal injury cover must be €7,600,000.00 (seven million six hundred thousand euros) and material and immaterial damage cover €2,300,000.00 (two million three hundred thousand euros). Supply a mock-up of the script for the pyromusical show proposed. Supply a mock-up of the soundtrack for the pyromusical show proposed. Supply an estimate of the pyrotechnical products proposed, along with their country of origin. Entries will be examined by the Coordinator and submitted to the Organiser. The Organiser will select four entries. All entrants will be sent a letter indicating whether or not they have been selected. Dates will be allocated to the participants in agreement with the pyrotechnists where possible, and as a last resort will be determined by a random draw in the presence of the Coordinator, the Representative of the Espace Léo Ferré and the Manager of the Espace Léo Ferré. Arrival of fireworks:at 21.00, two days before the day of the display, unless otherwise indicated. Accommodation / Travel / Internal transport:organised and paid for the entrant (the Coordinator may assist the entrant with finding a hotel). The Coordinator will provide all of the resin mortar tubes for the display, a list of which must be supplied by the participant beforehand, and will handle their storage. The participant may provide any equipment of his choosing, in addition to or as a substitute for equipment supplied by the Coordinator. Rental costs for any additional equipment will be borne by the participant. The Coordinator will provide the participant with a vehicle approved for the carriage of dangerous goods. The Coordinator will supply appropriate firefighting materials which will be installed in the firing area. Each participant must meet all their other technical requirements, such as connecting wires, electric boxes, etc. The Coordinator is responsible for ensuring that the pyrotechnical installations are compliant and that the participant follows safety rules. All fireworks are to be supplied by the participant, at his sole liability.The Organiser will cover the costs of customs clearance for dangerous materials (excluding any additional taxes and storage costs) for pyrotechnists based outside the European Union and wishing to import fireworks from their country of origin. In this case, the participant must provide an estimate of the customs clearance costs. The bombs used must imperatively have cardboard shells with biodegradable fallout. Fireworks may be set up from 07:00 on the day before the display. Aerial maroons are not permitted. Italian-style multiple effect shells are not permitted. Shells must be positioned in accordance with the products' safety distances, which must not exceed 160 metres. Pyrotechnists are required to follow the instructions given by the Coordinator when positioning shells on-site. The positioning of shells will be subject to approval by the Technical Committee for Health, Safety & Environmental Protection (Commission Technique d’Hygiène, de Sécurité et de Protection de l’Environnement). There are no restrictions on the origin of products used, subject to approval in the country of origin. Certain fireworks, rockets, flying saucers, etc., the trajectory and/or effect of which can vary depending on wind conditions, may be removed or modified on the orders of the Coordinator, at any time until the scheduled firing time. An additional, independent connection line may be included for this purpose. The Jury will be informed of any such change, in order to ensure that the participant is not penalised. Aquatic fireworks are permitted. They must be fired in line with the port entrance. Each firework must be labelled "DANGER - EXPLOSIVES". Any participants wishing to use a firework that does not appear in the categories mentioned may submit the relevant product's technical details along with their firing application. The above-mentioned Technical Committee for Health, Safety & Environmental Protection will examine the file and give an opinion. The firework concerned may not be used without the Committee's permission. Any breach of this rule will result in the participant being disqualified. Two detonation shells of a maximum of 75 mm must be fired to announce the start of the display. No access is permitted to the firing area for thirty (30) minutes. Participants will be required to wait until this period has elapsed before returning to the firing area. Any dud fireworks that have failed to fire correctly must be destroyed in-situ by the participant. The site will be inspected by an accredited Officer of the Monaco Fire Emergency Service (Corps des Sapeurs-Pompiers de Monaco), with the participant and the Coordinator both present. Participants will be required to sort and classify pyrotechnical waste on the site as instructed by the Coordinator in accordance with applicable regulations. A general plan of the site. All pyrotechnical displays in the Principality of Monaco are subject to the above-mentioned Ministerial Decree n° 96-137 of 11 April 1996, and more generally by current applicable regulations and any subsequent regulations which may replace them. Participants are required to complete an application for firing authorisation (appended to this document). Copy of the definitive soundtrack to accompany the firing + list of tracks and artists. The pyrotechnist will be responsible for obtaining the necessary rights for the music used at the competition, along with any associated broadcasts including via TV and Internet. The ORGANISER must be exempt from any liability whatsoever regarding the use of audio soundtracks. Copy of the above-mentioned Ministerial Decree n°96-137 of 11 April 1996, or any regulatory text which replaces it, initialled and bearing the participant's signature. All participants will be required to submit the complete authorisation application file, containing all of the necessary documents, to the Coordinator by 20 May 2019. A general PA system will be installed at Port Hercule and Avenue d’Ostende by the Organiser. Sound checks: Sound checks will be carried out on the afternoon before the display. All participant application files will be examined by the Coordinator and then sent to the Organiser, at least eight (8) weeks prior to the date of the first firing. The Organiser will then take responsibility for submitting the files to the competent authorities. On-site set-up of the display will be subject to approval by the Technical Committee for Health, Safety & Environmental Protection, and accepted after a final inspection on the day of the firing, at the time indicated in the firing authorisation document. The inspection will be conducted in the presence of the participant, the Coordinator, and the Manager of the Espace Léo Ferré or his representative. This inspection will authorise the firing. However, inspections of the firing area will be conducted by the Monaco Fire Emergency Service (Corps des Sapeurs-Pompiers de Monaco), the Coordinator and the Manager of the Espace Léo Ferré, who may order the participant to make modifications if necessary. The Organiser and the Coordinator reserve the right to ask participants to make any changes to the schedules of their pyrotechnical displays deemed necessary for essential security reasons. All participants will receive remuneration from the Organiser for their pyromusical displays. A global fixed amount of€30,000.00 (thirty thousand euros excluding taxes) will be paid to each participant. VAT will be applied in accordance with the convention on intracommunity VAT, and will be paid directly to the pyrotechnist or the Monaco Department of Tax Services (Direction des Services Fiscaux). balance of the global amount (excl. taxes) to be paid within forty-five (45) working days following the display. The site will be secured and monitored, from the start of set-up until after firing has been completed, by a private security firm with accreditation to operate in the Principality of Monaco, hired by the Organiser. Public lighting at the firing location and Port Hercule in Monaco will be switched off for the duration of the display. The order to switch off all lights at the location will be given by the Organiser prior to the display. An electrical connection with 220V 16A sockets will be installed by the Organiser at the firing console, which may not be situated more than 100 metres from the power supply point (French sockets). The Jury:The Jury will be chaired by the Mayor or by any person appointed by him. Each member of the Jury will attend all of the displays. Results date:Results will be available after the final display has been fired. Atmospheric conditions may be taken into account during set-up of the fireworks and during the firing itself (humidity, rainfall, wind speed and direction). In the event of rising winds during the firing of a display and posing a danger for persons and property, the Manager of the Espace Léo Ferré and the Coordinator may order the firing to be interrupted. The winning entrant will receive the sum of €10,000.00 (ten thousand euros inclusive), a trophy and a certificate. The winner will be automatically selected for the final in 2020 and will compete for the winners of the previous four editions of the competition. The second-placed entrant will receive the sum of €5,000.00 (five thousand euros inclusive of all taxes), a trophy and a certificate. The third and last placed entrants will each receive a trophy and a certificate of participation. In the event of a tie, the president of the Jury will have the casting vote. Any participant who withdraws from the event, having previously committed to take part, will be required to reimburse the down-payment and in addition to pay a fixed compensation fee of €5,000.00 (five thousand euros inclusive of all taxes), to the Organiser. No expenses incurred by the participant for the purposes of participating in the event will be reimbursed. If the participant is unable to set up fireworks within the allotted times, resulting in the display being cancelled, then the Organiser will be entitled to claim reimbursement of the down-payment made, along with additional expenses upon presentation of invoices or order forms, and a fixed compensation fee of €5,000.00 (five thousand euros) inclusive of all taxes. The Organiser may cancel a firing and/or the firework competition for the following reasons: public or political reasons (state of emergency, terrorist attacks, public disasters, war, revolution, national mourning, general strike, rioting, epidemic), force majeure, bad weather or for reasons of essential meteorological safety. If the participant has arrived in the Principality and the fireworks are either in the process of being set up or have already been set, and are damaged and either partially or totally lost: the participant may keep the down-payment and the full contractual amount will be paid. It is stipulated that any transport problems affecting the participant’s crew will not be considered to constitute force majeure for cancellation. In all circumstances other than those described above, the participant shall not be entitled to claim any other compensation of any kind. If one display is cancelled, the conditions for awarding of prizes will remain unchanged for the three remaining participants. Second prize: a certificate and a trophy. If three displays are cancelled, the participant whose display goes ahead will receive a certificate and a trophy. If the entire competition is cancelled, the participants will be invited to compete the following year subject to the same conditions. If the firework display does not last the required duration of twenty (20) minutes: a penalty of €1,000.00 (one thousand euros inclusive of taxes) will be applied per minute of non-performance. If the firework display does not commence at the allotted time as a result of the participant’s actions or inaction, and except in cases of force majeure,a fixed penalty of €500.00 (five hundred euros exclusive of taxes) may be applied per minute, after the starting signal has been given and until the display commences. 16.2 -Formal notice of any decision taken under Articles 15 and 16 above must be given by registered letter with return receipt or delivered by hand and signed jointly by the Parties. 16.3 - Termination of the contract will not affect the right to bring legal proceedings against the participant for breaching his obligations. The participants assign to the Organiser all rights to the pyromusical show. These rights include reproduction rights, performance rights, rights to adapt or alter all or part of the show, and the right to incorporate all or part of the show into any pre-existing or future work. 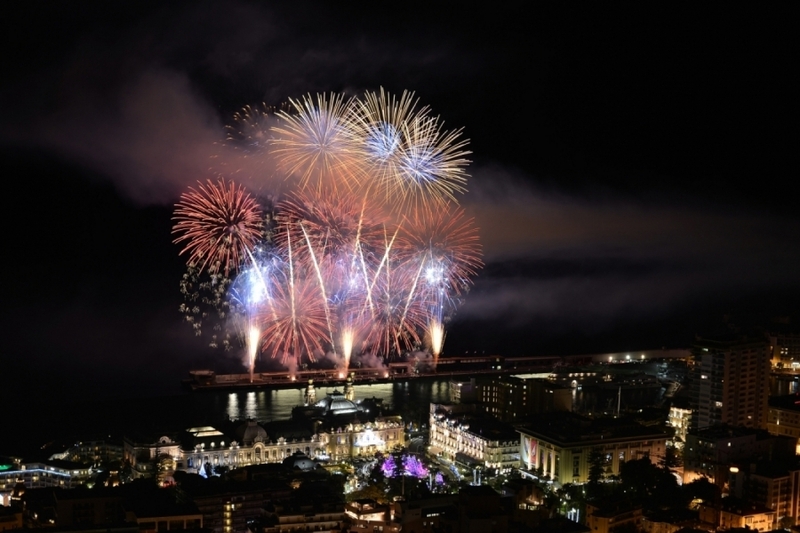 Certain personal information concerning the pyrotechnists is processed by automated means for the purposes of promoting the Monaco Art en Ciel Competition on the website at www.monaco-feuxdartifice.mc, operated by Monaco City Hall. Participants in the competition have the right to access and rectify their personal data, and this right may be exercised with the Espace Léo Ferré, under data protection Law n°1165 of 23 December 1993 (amended). Any dispute concerning the interpretation or application of these rules, including termination thereof, and which cannot be resolved amicably, will be referred to the exclusive jurisdiction of the Courts of the Principality of Monaco, and subject to Monegasque law. These rules have been drafted in French. Where translations into one or more other languages exist, only the French version of the text shall have legal force in the event of a dispute.